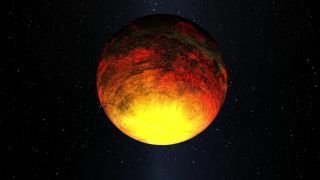 Artist's concept of Kepler-10b, which was detected by NASA's Kepler mission. Kepler scientists say it's the first "unquestionably rocky" alien planet ever found. SEATTLE – NASA has discovered the smallest planet ever seen beyond our solar system – a rocky world just 1.4 times larger than Earth – using its planet-hunting Kepler observatory. The planet, called Kepler-10b, is also the first rocky alien planet to be confirmed by NASA's Kepler mission using data collected between May 2009 and early January 2010. But, while Kepler-10b is a rocky world, it is not located in the so-called habitable zone – a region in a planetary system where liquid water can potentially exist on the planet's surface. "Kepler-10b is the smallest exoplanet discovered to date, and the first unquestionably rocky planet orbiting a star outside our solar system," said Natalie Batalha, Kepler's deputy science team leader at NASA's Ames Research Center in Moffett Field, Calif., at a press conference here at the 217th American Astronomy Society meeting. "It's an important milestone for our team, and I think it's an important milestone for humanity," said Batalha, who also led the study that discovered the newfound world. The research will appear in an upcoming issue of The Astrophysical Journal. Kepler-10b is the latest in the growing legion of extrasolar planets scientists are discovering around alien stars. To date, more than 500 exoplanets have been confirmed. Kepler-10b orbits its parent star once every 0.84 days, which means it is more than 20 times closer to its star than Mercury is to our sun, which places it outside the parameters of the habitable zone. Kepler-10 is located about 560 light-years away and is approximately the same size as our sun. The star's age is estimated to be 8 billion years old. The exoplanet’s star, Kepler-10, was the first one identified as capable of harboring a small transiting planet, placing the star at the top of the list for ground-based observations using the W.M. Keck Observatory 10-meter telescope in Hawaii. Scientists waiting for a signal to confirm Kepler-10b as a planet were not disappointed. Keck was able to measure tiny changes in the star's spectrum, called Doppler shifts, caused by the telltale tug exerted by the orbiting planet. "The discovery of Kepler-10b is a significant milestone in the search for planets similar to our own," said Douglas Hudgins, Kepler program scientist at NASA headquarters in Washington, D.C. "Although this planet is not in the habitable zone, the exciting find showcases the kinds of discoveries made possible by the mission and the promise of many more to come." Knowledge of the planet is only as good as the knowledge of the star it orbits. Since Kepler-10 is one of the brighter stars being targeted by Kepler, scientists were able to detect high-frequency variations in the star's brightness generated by stellar oscillations, or starquakes. This analysis allowed scientists to pin down Kepler-10b's properties. The researchers picked up on a clear signal in the data arising from light waves that travel within the interior of the star. Kepler Asteroseismic Science Consortium scientists use the information to better understand the star, just as earthquakes are used to learn about Earth's interior structure. As a result of this analysis, Kepler-10 is one of the most well-characterized planet-hosting stars in the universe. And this is good news for the team studying Kepler-10b. Accurate stellar properties yield accurate planet properties. In the case of Kepler-10b, the picture that emerges is of a rocky planet 1.4 times the size of Earth, with a mass that is 4.6 times that of Earth, and an average density about as dense as an iron dumbbell. "It looks to be overdense, in the same way Mercury is overdense," Batalha said. The surface gravity of Kepler-10b is also thought to be more than twice that of Earth, Batalha said. So, it is unlikely that the exoplanet has big mountains. Instead, there may be canyons carved by molten rock. The Kepler observatory stares at more than 156,000 stars in a star field located in the constellations Cygnus and Lyra. Kepler is the first NASA mission capable of detecting Earth-size planets in or near the habitable zone. The spacecraft's ultra-precise photometer measures the tiny decrease in a star's brightness that occurs when a planet crosses in front of it. The size of the planet can then be derived from these periodic dips in brightness. The distance between the planet and the star can also be calculated by measuring the time between successive dips as the planet orbits the star. "This planet, Kepler-10b, will go into every textbook in astronomy, worldwide," said Geoff Marcy, a professor of astronomy at the University of California, Berkeley. "I think it is clearly a historic discovery." Follow SPACE.com Senior Writer Mike Wall @michaeldwall for the latest from the 217th AAS American Astronomy Society meeting. SPACE.com Staff Writer Denise Chow contributed to this report from New York City.